I love these, I’d choose these over Cadbury chocolates. Only because I find Cadbury chocolate way tooooo sweet! Can easily be found at IGA or Coles. The price is quiet good too. Every time I want a bite I break off a block and enjoy it, as it slowly melts in my mouth, I never rush with eating chocolate. You gotta know how to eat it haha. You can’t beat Jaffa’s. They are best and so good for sharing. This share pack is the perfect size with plenty for everyone! Gorgeous little balls of chocolate coated in a crispy orange shell have to be yummy and delectable Jaffas. They are a fabulous choc orange treat. As a kid I used to sneak into my mum’s room to raid her top draw because she always had a bag of Jaffa’s hiding there. So good. Jaffa’s were around when I was a kid and now I have kids of my own. Still love the taste of the choc orange balls. The hard coating and delicious chocolate filling. Still a favourite of mine and now the kids as well. Allen’s Jaffas are a delicious ball of a combination of orange and chocolate.It is a crowd pleaser every time for parties and friends popping over. Jaffa remind me of my wedding day! I had dieted for so long, to look good in my wedding dress and then the night before the wedding, I went crazy and ate a whole bag of Jaffas!! Love the crunchy shell and the small chocolate ball! Will always be a favourite of mine! 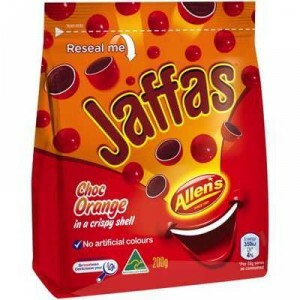 How would you rate Allen’s Jaffas?